In 1905 Walter Slater succeeded Frederick Rhead as Art Director of Wileman & Co. 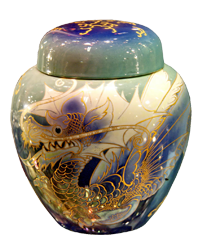 It is not known why Frederick Rhead left but this was a time of economic downturn and the company needed to return to commercially risk free wares. Walter Slater came from a distinguished family in the industry. He had previously worked at the Minton and Doulton factories and thus his background was as impressive as that of Frederick Rhead. Initially Walter Slater did not have as much freedom to experiment as his predecessor but had a freer rein after 1911. Besides continuing the popular production wares, such as toilet sets, children's ware, jelly moulds, souvenir and heraldic ware, he also designed a new second series of Intarsio which was produced from 1911 to 1913. The second series patterns reflected Persian influences. He also oversaw the development of fine tableware with the "Oleander" shape being introduced in 1913. 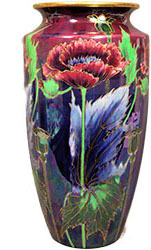 In 1922, a new range of Lustre-decorated ware of high quality was introduced most of which he signed. The range included floating flower bowls, spill vases, ginger jars and clocks. 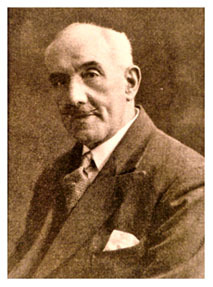 Walter Slater retired in 1937.